The knowledge about the sorptive character of porous materials is important during their manufacturing, checking their quality and exploitation. In the case of hydrophobized materials such characterisation may be useful not only for description of porous structure but also for measurement of their hydrophobization degree. 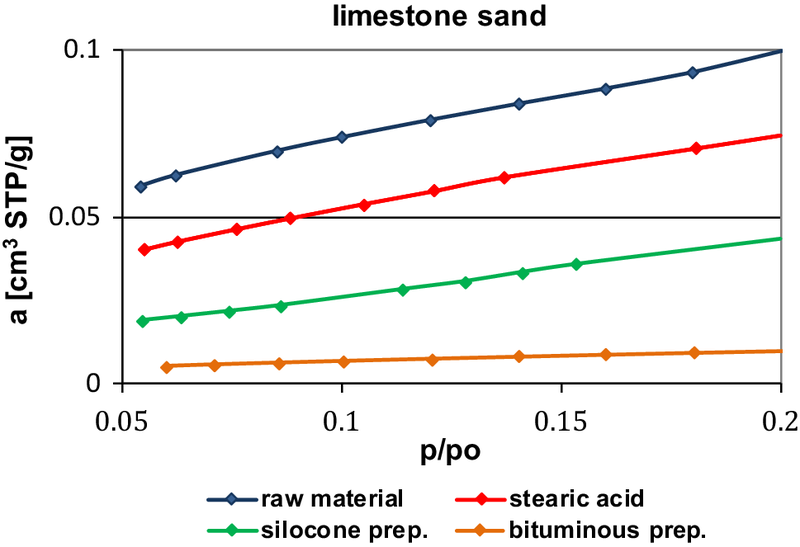 Two grain fractions of fine dispersional limestone of grain diameter in accordance with the manufacturer’s data (Limestone Mine Czatkowice) equals less than 80 µm for lime meal and 100–400 µm for lime sand were investigated. The techniques of limestone powder hydrophobization were carried out in apparatuses of own design and are described in previous works of authors (Vogt, Opaliński, Chem. Engineer. Trans. 17:1711–1716, 2009; Vogt, Pol. J. Environ. Stud. 20:801–804, 2011; Vogt, Pol. J. Chem. Technol. 10:49–51, 2008; Buczek, Vogt, Polish Patent. PL 396668, 2013). All modified samples acquired the hydrophobic character but hydrophobic degree of materials was measured with the use of various techniques, therefore it was difficult to compare obtained results. It is the reason why the authors used the adsorption measurements as a method to characterize the hydrophobic properties of materials. In the adsorption measurement two gases: nitrogen and krypton were used as adsorbats. The adsorption isotherms were determined for both raw and modified by commercial modifiers (stearic acid, silicone preparation and bituminous preparation) fine dispersional limestone material. 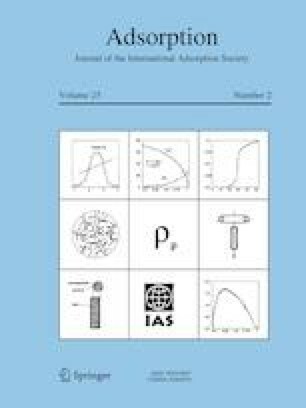 The volume of pores, specific surface area were calculated from the experimental adsorption isotherms (Rouquerol et al., Adsorption by powders and porous solids, Academic press, London, 1999; Gregg, Sing, Adsorption, Surface Area and Porosity, Academic Press, London, 1982). The adsorption value obtained for hydrophobized materials is generally lower than for raw materials. Obtained results enable us to make characterization of the fine dispersional limestone after the hydrophobization process. Regardless of the gas (nitrogen or krypton) used the adsorption value obtained for hydrophobized materials is in principle lower than for raw materials. However, it is more important that the mutual position of the isotherms obtained for materials modified with the use of individual modifiers is the same for both used adsorbs, krypton and nitrogen. This fact makes it possible to determine the degree of hydrophobization of the lime material modified with the use of various modifiers. Limestone is a very valuable raw material, widely used in many industries. Because of rich Polish resources of limestone there is a wide range of use of this mineral in the production of lime and limestone meals, which in turn are further used in the cement industry, glass and ceramics, pulp and paper industry, chemical and steel industry, construction, agriculture, sugar industry and for the production of paints and varnishes, rubber and plastics, and in coal mine (Fang et al. 2014; Harrison et al. 2006; Grzeszczyk and Podkowa 2010; Domka et al. 2003; Ciesielczyk et al. 2006; Hu et al. 2009; Malicka-Soczka et al. 2010; Polish Standard 1994; Cashdollar and Sapko 2006; Man and Teacoach 2009; Vogt 2008). What kind of material is useful for the specific application areas results directly from its properties. As an example, hardness and durability are important for chipping in road construction industry. 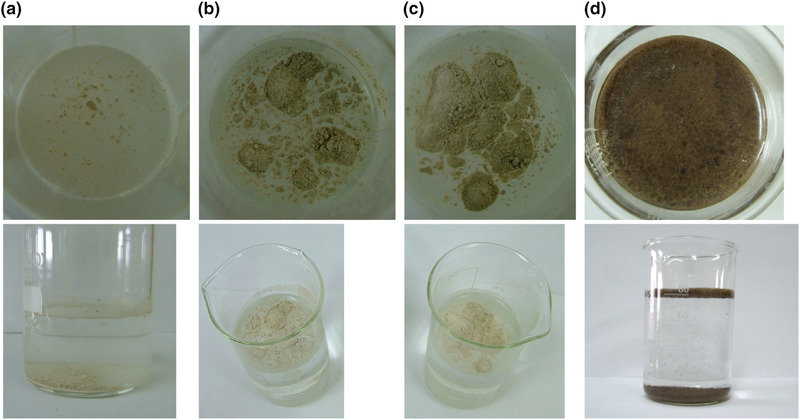 For desulphurisation processes the material reactivity will be significant (De Diego et al. 2011; Hu et al. 2006; Szymanek and Nowak 2007). The important properties for other uses may be: shape, size, flow properties, abrasibility, vulnerability to compact and granulation (Frances et al. 2001; Eskin and Voropayev 2001). The long experience of the use of limestone indicates that the most important feature in all applications is the resistance of this material to the weather conditions. Buildings made of limestone are susceptible to destruction being result of weathering and corrosion (Smith et al. 2010; Siegesmund et al. 2014) and the limestone porous structure is in many cases responsible for the quick destruction of the material. The open-pore system enlarges the contact surface and it is an excellent way for harmful factors to get into the material. Porous limestone absorb water very easily, simultaneously the salts dissolved in water reduce the surface tension of the liquid and cause surface wetting and consequently make the process of destruction easier. High absorbability of the limestone causes not only destruction of buildings, but also is responsible for occurring adhesion contraction and agglomeration of fine dispersional limestone materials, which significantly impairs their use in many areas. Waterproof modified fine dispersional limestone is a valuable material, more useful than its raw form for example in the form of hydrophobized limestone meal applicated as an antiexplosive dust in coal mines (Polish Standard 1994; Vogt 2011; Man and Teacoach 2009) or during the renovation of the architectural monuments (Getty Conservation Institute 2006; Medeiros et al. 2012). Paints containing fine dispersional limestone and water resistant substances are used to protect the limestone surface after removal of pollutants layers (Grossi et al. 2003; Urosevic et al. 2012). The dust used for the production of concrete should be hydrophobized because of the addition of raw fine dispersional limestone increasing water requirements (Łukowski 2005). To sum up hydrophobization is a beneficial process from the economic point of view. Hydrophobic materials are sensitive to a harmful effect of humidity to a much lower degree than solids with similar applications but not possessing this characteristic. An overview of the literature on the hydrophobization implies that although there was a lot of attention paid to hydrophobic processes, usually the studies dwell on securing building materials - the subject concentrated on the specific interaction between moisture and large surface. The phenomena occurred during the hydrophobization of fine solids is rarely described in literature. The most of works narrow down the issue to the evaluation of hydrophobization degree of waterproof materials. The acquaintance of hydrophobization degree is important because it enables to evaluate the product durability at humid conditions for its usage. There are some methods which may be applied for this purpose, but some of them are so specific that it’s possible to apply them only in exceptional cases (Fuerstenau and Williams 1987; Lazghab et al. 2005; Chander et al. 2007; Dang-Vu and Hupka 2005; Teixeira et al. 1998; Polish Standard 1994).Therefore the consideration should be given to searching for new methods of measurements of hydrophobic properties of fine dispersional materials. During the research work on that problem is worth to remember that in spite of the hydrophobic properties the material must be characterised by other valid quality needed for their application. In the case of porous fine dispersional material it would be adsorption properties. The acquaintance about the sorptive character of porous materials is important during manufacturing, checking their quality and its exploitation. And it is interesting how the hydrophobization processes influence on adsorption properties. 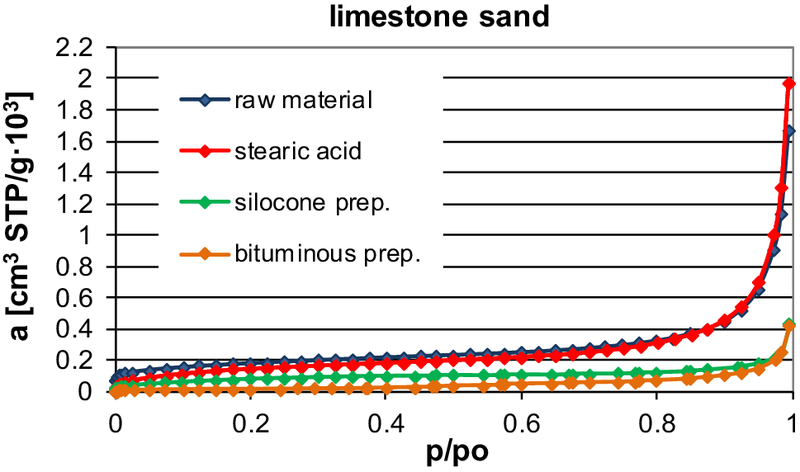 The author proposed using the adsorption measurements as a method of characterization of modified fine dispersional limestone. 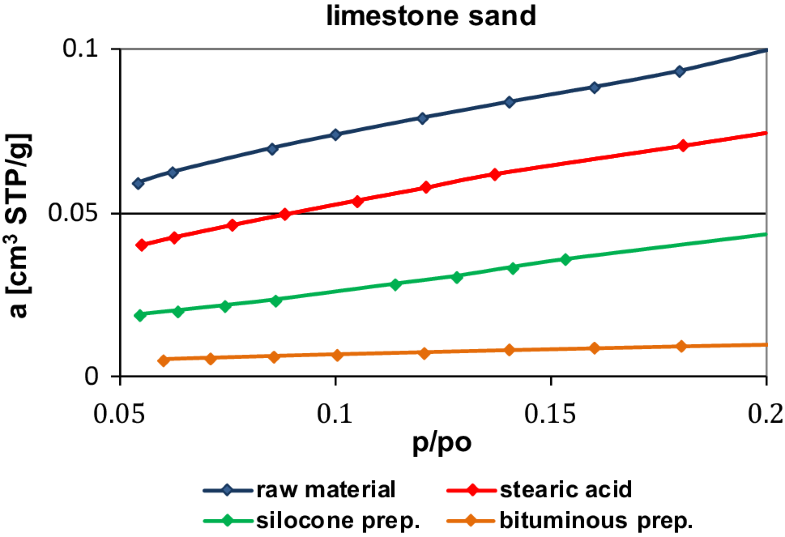 Two grain fractions of fine dispersional limestone of grain diameter in accordance with the manufacturer’s data (Limestone Mine Czatkowice) equals less than 80 µm for lime meal and between 100 and 400 µm for lime sand were investigated. The average chemical composition of limestone—manufacturer’s data is showed in Table 1. During the modification processes commercial modifiers: stearic acid, silicone preparation and bituminous preparation were used. Stearic acid is used in mining production plants for the production of water-resistant powder preventing the coal dust explosion (Polish Standard 1994). Other modifiers used in the research are existing on the market as representative groups of compounds applied to the hydrophobization processes of mineral materials; these are the silicone preparation (Sarsil® H-15—Chemical Plant “Polish Silicones” Ltd in Nowa Sarzyna) and the bituminous preparation (Bitumenovoranstrich—KÖSTER BAUCHEMIE AG Ltd, Kraków) The method of limestone dust hydrophobization with the use of stearic acid was carried out in the installation of own design, and it consisted in free sedimentation of the dust layer dispersed by stearic acid vapour in dust countercurrent flow (Vogt 2011). The second method of producing of hydrophobic limestone powder consists in mixing raw material with commercial modifiers: silicone solution (Sarsil® H-15) or bituminous preparation in the evaporating dish. The techniques of limestone powder hydrophobization are described more precise in previous works of authors (Vogt 2008, 2011; Vogt and Opaliński 2009; Buczek and Vogt 2013). One of the most important issues is the determination of the index of hydrophobization of modified samples. The conducted literature analyses indicate that, although there are a large number of works on hydrophobization processes, there are no uniform techniques of determining the hydrophobization degree (Lazghab et al. 2005; Chander et al. 2007; Dang-Vu and Hupka 2005; Teixeira et al. 1998; Polish Standard 1994; Washburn 1921; Dang-Vu et al. 2006; Hołownia et al. 2008; Karagüzel et al. 2005; Norris et al. 1999; Fuerstenau and Williams 1987). It is difficult to find a single research method which could be applied to determine the hydrophobization degree of fine dispersional materials modified with the use of various modifiers and it is difficult to interpret results obtained for various materials. In this work a relative evaluation of the hydrophobization degree of the analyzed materials was based on a simple experiment so-called “floating on water” test (Vogt 2012). The experiment consisted of placing a small amount of powder on the surface of water in a beaker. Raw limestone dust became immediately moist and fell onto the beaker bottom. The complete portion of the hydrophobized materials remained on the water surface. The hydrophobization degree of materials modified in the work was evaluated on the basis of the dust amount floating on the water surface for a specified period of time. Figure 1 presents the photographs of “floating on water” test for the selected materials. The second method for characterisation of hydrophobic degree of modified materials used during researches was the measurement of wetting angle of water on the surface of compressed materials. Figure 2 presents the photographs concerning this test for the limestone sand. The values of wetting angles are shown in Table 2. The hydrophobicity of fine dispersional limestone has been also studied by the determination of nitrogen and krypton adsorption isotherms, using the ASAP 2020, Micromeritics. Krypton adsorption at ≈ 77 K is considered to be the standard method for routine surface area measurements of material with low surface area. However, the use of krypton has some disadvantages compared to the nitrogen. Firstly krypton is more expensive than nitrogen. Another problem with applying krypton adsorption is the fact of the possibility of using narrow range p/p0 (D4780). The volume of pores was calculated from the experimental nitrogen adsorption isotherms directly for the relative pressure adequate to p/po = 0.98. The parameters of the porous structure: specific surface area using BET (SBET) and Dollimore-Heal’s (SDH) methods were also calculated (Dollimore and Heal 1964; Gregg and Sing 1982; Rouquerol et al. 1999). 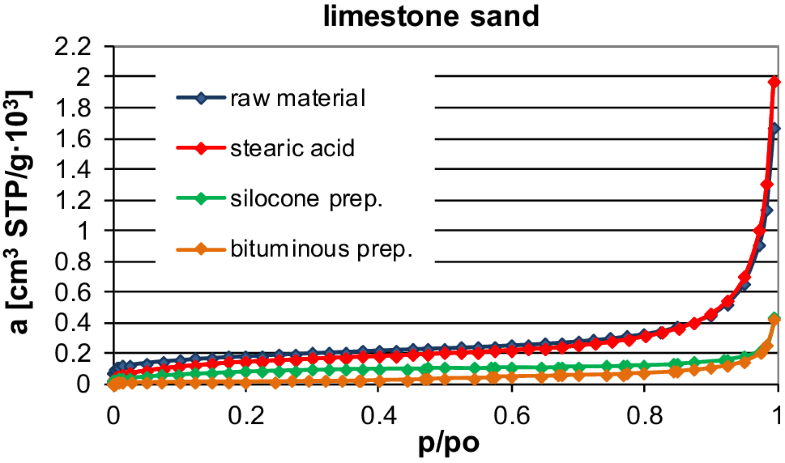 The results showing consolidated nitrogen adsorption isotherms obtained for limestone mile and sand are shown on the Figs. 3, 4 and krypton isotherms on the Figs. 5, 6. The pores volume and the parameters of the porous structure of specific surface area SBET and SDH are presented in Tables 3 and 4. Considering the results of the “floating on water” test, it was noticed it is visible that the limestone meal modified in stearic acid vapours or by mixing with the SARSIL® H-15 preparation obtained the best hydrophobic properties (Fig. 1). In the case of meal modified with the Bitumenovoranstrich preparation we can see that some portion of material fell onto the beaker bottom. The similar observation were done for the limestone sand. On the base of obtained wetting angles it can be stated that the sand hydrophobized by stearic acid obtained the highest hydrophobization degree among others sands. 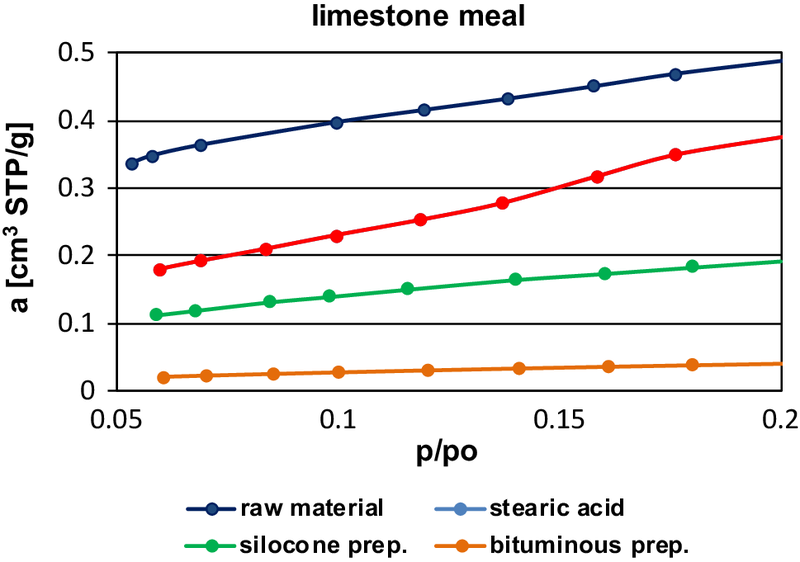 In the cause of smaller fraction, the meal hydrophobized by silicone preparation achieved the highest hydrophobization degree. 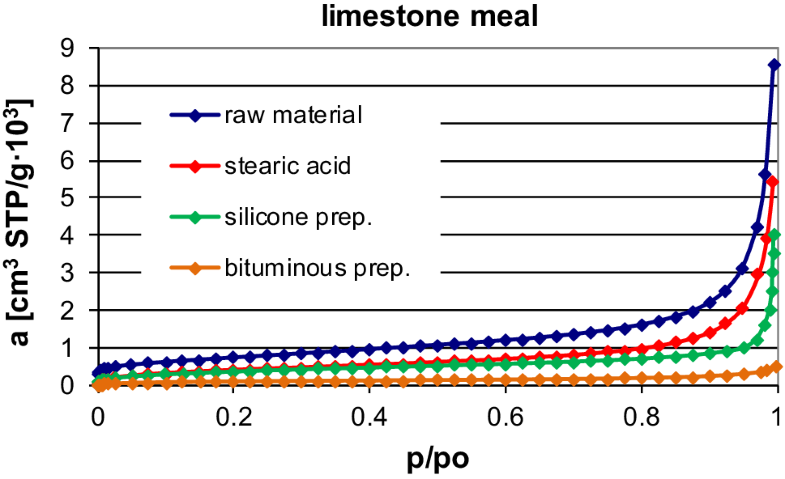 The fact that the wetting angle obtained for meal modified by bituminous preparation is bigger than this one obtained for meal modified by stearic acid was even more surprising. That shows that the values of hydrophobization degree can’t be compare if the different measurements methods for different modifies were used. The adsorption value obtained for hydrophobized materials is, in principle, lower than for raw materials. The entrance to the pores inside particles is probably blocked by the modifiers. That is why, the material is well protected against moisture and this is the positive effect of the hydrophobization. The differences between the adsorption parameters (Tables 3, 4) for raw and modified materials, especially in the case of stearic acid are not large. However, the effect of modification is visible in these results. The material after hydrofhobization has obtained the properties that will allow it to be stored, transported and dispensed more easily, and, at the same time, its sorption properties are not significantly deteriorated. Regardless of the gas (nitrogen or krypton) used during measurements, for two granulations of the studied materials (meal and sand), the adsorption curves are arranged in the same way. They are located on the graph from the lowest curve for the bituminous preparation to the highest one for the raw material (Figs. 3, 4, 5, 6). These are very interesting results for characterisation of the studied materials from the point of view of its hydrophobic degree. The adsorption measurements are confirmed by the results obtained in “floating on water” test. 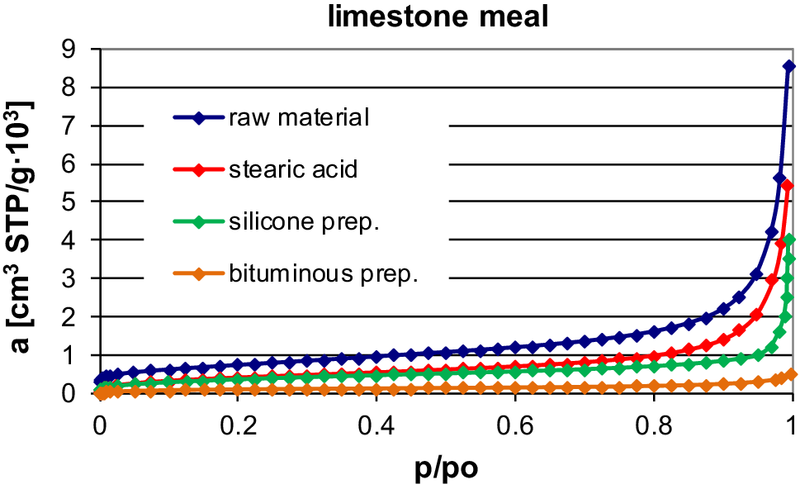 This indicates that it is possible to characterize the hydrophobic properties of fine dispersional limestones on the basis of the results obtained by adsorption measurements. Based on the position of the adsorption curves, the modified materials can be arranged from the least hydrophobic to the most hydrophobic one. In addition, based on the values of the pore volume, especially in the case of meal, the numerical hydrophobization degree (in comparison to the raw material) can be estimated. The krypton adsorption measurements in this case are more useful than the sorption of nitrogen. Based on these measurements, it can be concluded that meals modified sequentially with stearic acid, silicone and bituminous preparation are by 0.83%, 0.33% and 0.17% more hydrophobic than raw material. Based on the Vtot 0.98 parameter, the above correlation is as follows: 0.69%, 0.27%, 0.07%. Taking into account the price of both gases, it can be concluded that in comparative applications of the assessment of the degree of hydrophobization, the results obtained on the basis of nitrogen sorption isotherms are also satisfactory. Given the fact, how difficult it is to determine the degree of hydrophobization for the materials modified with different formulations, such results prove to be very useful when characterizing such materials. The research was carried out to determine the changes in the adsorption parameters of the modified limestone materials. It is interesting whether the degree of coverage of the material surface with a modifier can be treated as a measure of the surface hydrophobicity? The obtained results enable researchers to evaluate the characteristics of the fine dispersional hydrophobized materials and provide information about the phenomena taking place during the hydrophobization process. In the case of hydrophobized materials this characterization may not only be useful for description of porous structure but also for measurements of hydrophobization degree of such solids. The obtained results allow for assessing the direction of changes of limestone powder’s properties caused by the hydrophobization process. It can be concluded that stearic acid is the best hydrophobic agent if one wants to obtain a material with good hydrophobisity, sorption properties insignificantly changed, in relation to the properties of raw material. Polish Ministry of Science and Information Society Technologies under AGH statutory Project No. 11.11.210.374.